The temples at Jageshwar, in the background of Darukavana, the holy Deodar forest. According to Shiv Mahapuraan, Brahma (The Creator) and Vishnu (The Preserver) once had a disagreement about which of them was supreme. To test them, Shiva pierced the three worlds as an immeasurable pillar of light, the Jyotirlinga. Vishnu and Brahma parted company to determine the extent of each end of the pillar. Brahma, who had set off upward, lied that he had discovered the upper end of the pillar, but Vishnu, who had gone in the direction of the base of the pillar, admitted that he had not. Shiva then appeared as a second Jyotirlinga and cursed Brahma, telling him that he would have no place in the ceremonies, though Vishnu would be worshipped until the 'end of eternity'. The Jyotirlinga is the supreme indivisible reality from which Shiva appears. Jyothirlinga shrines commemorate this time when Shiva appeared. It was believed that there were originally sixty-four jyothirlingas. Twelve are considered to be especially auspicious and holy. Each of the twelve sites takes the name of the presiding deity and each is considered a separate manifestation of Shiva. At all these sites, the primary deity is a lingam representing the beginning less and endless Stambha pillar, symbolizing the Shiva's infinite nature. 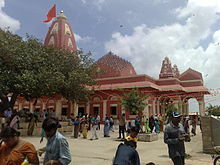 The twelve jyothirlinga are Somnath in Gujarat, Mallikarjuna at Srisailam in Andhra Pradesh, Mahakaleswar at Ujjain in Madhya Pradesh, Omkareshwar in Madhya Pradesh, Kedarnath in Himalayas, Bhimashankar in Maharashtra, Viswanath at Varanasi in Uttar Pradesh, Triambakeshwar in Maharashtra, Vaidyanath at Deoghar in Jharkhand, Aundha Nagnath temple in Maharashtra, Rameshwar at Rameswaram in Tamil Nadu and Grishneshwar at Aurangabad in Maharashtra. The Shiva Purana says Nageshvara Jyotirlinga is in 'the Darukavana', which is an ancient name of a forest in India. 'Darukavana' finds mention in Indian epics, such as Kamyakavana, Dvaitavana, Dandakavana. A narrative in the Shiva Purana about the Nageshvara Jyotirlinga tells of a demon named Daaruka, who attacked a Shiva devotee named Supriya and imprisoned him along with many others in his city of Darukavana, a city under the sea inhabited by seasnakes and demons. At the urgent exhortations of Supriya, the prisoners started to chant the holy mantra of Shiva and immediately thereafter the Lord Shiva appeared and the demon was vanquished, later residing there in the form of a Jyotirlinga. The demon had a wife, a demoness named Daaruki who worshipped Mata Parvati. As a result of her penance and devotion, Mata Parvati enabled her to master the forest where she performed her devotions, and renamed the forest 'Darukavana' in her honour. Wherever Daaruki went the forest followed her. In order to save the demons of Darukavana from the punishment of the gods, Daaruka summoned up the power Parvati had given her. She then moved the entire forest into the sea where they continued their campaign against the hermits, kidnapping people and keeping them confined in their new lair under the sea, which was how that great Shiva devotee, Supriya, had wound up there. The arrival of Supriya caused a revolution. He set up a lingam and made the prisoners recite the mantra Om Namaha Shivay in honour of Shiva while he prayed to the lingam. The demons' response to the chanting was to attempt to kill Supriya, though they were thwarted when Shiva appeared and handed him a divine weapon that saved his life. Daaruki and the demons were defeated and Parvati saved the remaining demons. The lingam that Supriya had set up was called Nagesha; it is the tenth lingam. Shiva once again assumed the form of a Jyotirlinga with the name Nageshwar, while the Goddess Parvati was known as Nageshwari. The Lord Shiva then announced that he would show the correct path to those who would worship him. The actual location of the legendary forest of Darukavana is debated. No other important clues indicate the location of the Jyotirlinga. 'Darukavana' remains the only clue. "हिमाद्रेरूत्तरे पार्श्वे देवदारूवनं परम् पावनं शंकरस्थानं तत्र् सर्वे शिवार्चिताः।"
Because of this the 'Jageswara' temple in Almora, Uttarakhand is commonly identified as Nageshvara Jyotirlinga. The written name of Darukavana could be misread as 'Dwarakavana' which would point to the Nageswara temple at Dwaraka. 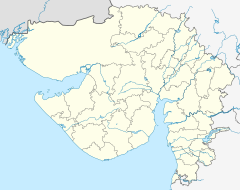 However no forest is in this part of Dwaraka that finds mention in any of the Indian epics. The narratives of Shri Krishna, mention Somanatha and the adjoining Prabhasa tirtha, but not Nageswara or Darukavana in Dwaraka. "Yamye sadange nagaretiramye vibhushitangam vividhaishcha bhogai Sadbhaktimuktipradamishamekam shrinaganatham sharanam prapadye"
This could be taken to mean that it is located in the south ['yamye'] at the town of 'Sadanga', which was the ancient name of Aundh in Maharashtra, south of the Jageswara shrine in Uttarakhand and west of Dwaraka Nageshvara. ^ a b c R. 2003, pp. 92-95. ^ Eck 1999, p. 107. ^ Gwynne 2008, Char Dham. ^ a b Lochtefeld 2002, pp. 324-325. ^ Harding 1998, pp. 158-158. ^ Chaturvedi 2006, pp. 58-72. Harding, Elizabeth U. (1 January 1998). Kali: The Black Goddess of Dakshineswar. Motilal Banarsidass. ISBN 978-81-208-1450-9. Wikimedia Commons has media related to Nageshvara Jyotirlinga. This page was last edited on 23 February 2019, at 20:00 (UTC).